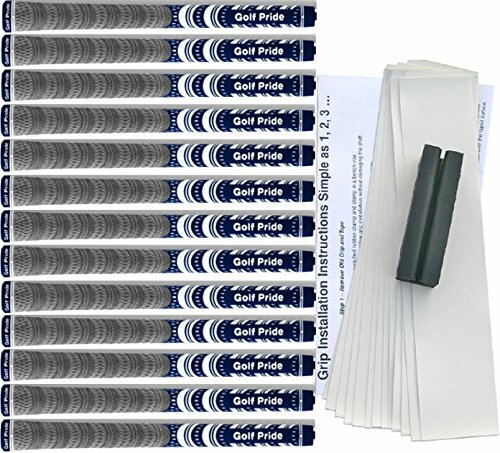 Golf Pride New Decade MultiCompound Platinum Blue Standard Golf Grip Kit (13 Grips, Tape, Clamp) by Golf Pride at Norwalk Foundation. MPN: MCC-PLA-BL. Hurry! Limited time offer. Offer valid only while supplies last. The New Decade MultiCompound Platinum Series from Golf Pride introduces four exciting new colors to this Tour-proven line of hybrid grips. The Platinum Series features a grey upper section designed with Golf Pride's exclusive BCT cord for all-weather control, and high-performance rubber in the lower hand for ultimate comfort and responsiveness. Colored end cap for contrast and product identification/call-out.